Weidenbach, M. & Pröbstl, U. 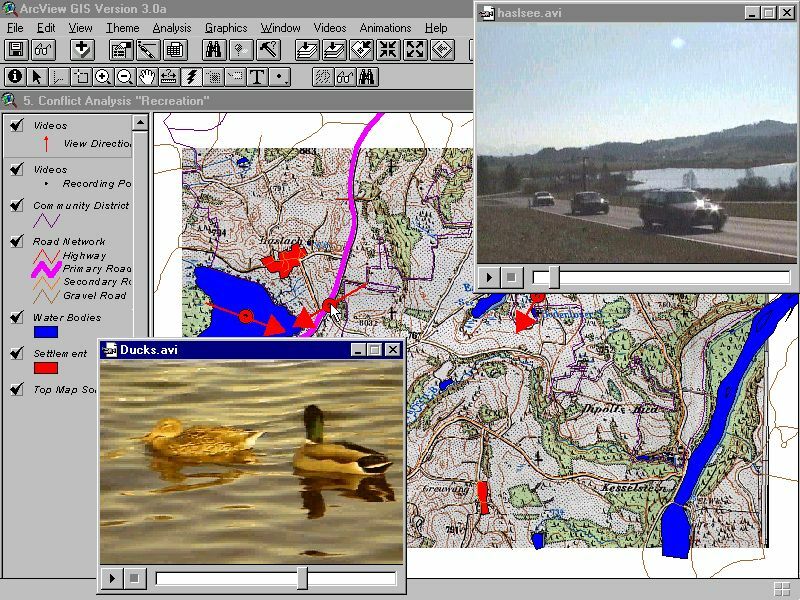 1998: Multimedia GIS: A New Tool For Landuse Planning. Forest & Landscape Research x/x: 1-16. Article with colour images. Description and examples on the technical design of a Multimedia GIS. To run all linked files properly on Windows you need Netscape Gold 3.0 (VRML viewer is included), a MPEG player (e.g. XingMPEG Player), video player from REAL and a sound card. burg_apr1.jpg: The first so called "View" (Thematic Map) of the ArcView presentation gives an overview of the Study Area of the Landscape Master Plan. burg_apr2.jpg: The View to analyse landscape aesthetics by means of visibility calculations (line of sight) and a virtual reality landscape model of the study area, displayed with Netscape Gold. burg_apr3.jpg: View for analysing recreation quality by means of sound videos to demonstrate the impact of noise. burg_apr4.jpg: View for analysing the impact of afforestations on the scenery and ecology be means of manipulated images and orthophotos. 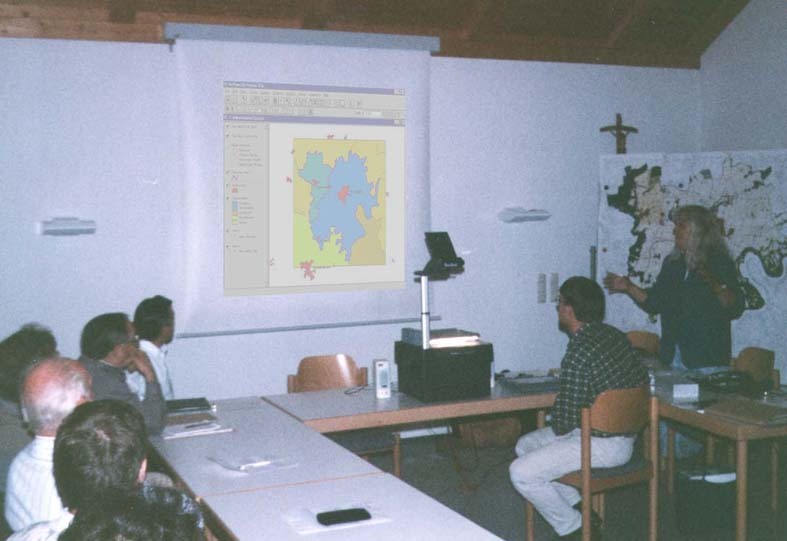 Like the classic GIS the Multi Media GIS is focused on using vector data (see BILL, 1996). That data core is supplemented by alphanumeric, sound, image and video data. At the very beginning of the planning process the existence of available digital data has to be proved. The official offer of spatial digital data is still rare in Bavaria. Additionally the price, distribution and licence policy is often left unclear. Probably the best spatial data for Bavaria can be found at the State Survey Branch in Munich, which offers different thematic layers of the official topographic map in the common DXF format. With the exception of that general data almost all other landscape and ecology related data has to be digitised by the landscape planers themselves, which is still very time consuming and expensive. Digitising from a Stereo Plotter (e.g. SD 2000 from Leica or Planicomp from Zeiss) with CAD or GIS software by cursor input on the system screen. Recording geometry and features of sites from distorted aerial photos or adequate terrestrial photos (WARNER, W.S., 1993) by means of the Monoplotting procedure on the screen or on a digi board. Digitising site geometry and eventually site features from orthophotos and aerial photo maps on the screen or on a digi board. Analogue or digital sound recording in the field, additionally in-house digitising and sound processing with sound card and audio software if necessary. Analogue sound-video recording in the field, digitising and computer processing with video capture card and video processing software. In practice the ideal way of data recording is often not possible since there are different data sources and formats which has to be integrated into the GIS. For instance, besides the photogrammetric landuse interpretation based on orthophotos or aerial stereo photo models, the field mapping of landscape features based on existing maps still remains necessary. Digital data enable the landscape planer to present his results in a transparent way even with a permanently increasing amount of planing data. Chiefly the possibility to overlay different thematic maps play an important role. In this way landuse conflicts can be quickly displayed numerically and graphically with high transparency and clearness for the user, which can’t be achieved by the conventional cartographic illustration. Turning different map layers on or off helps additionally to demonstrate and mediate separate planning steps. An important advantage of digital data and GIS is the analysis of 3 dimensional landscape models, which are the basis for visibility, slope, aspect, line of sight or watershed calculations (see burg_apr2). The time related analysis of the scenery can be done by implementing photorealistic simulations of alternative stages into the GIS or by linking multi-temporal video or photo sets. As mentioned above a transparent Landscape Master Plan is essential for the acceptance of designing proposals. A client friendly analysis and demonstration of planning results has become an important factor for landscape planners. A GIS which is able to simulate geo-referenced landscape stimuli is a suitable tool to produce a general conscious for relevant planning aspects. 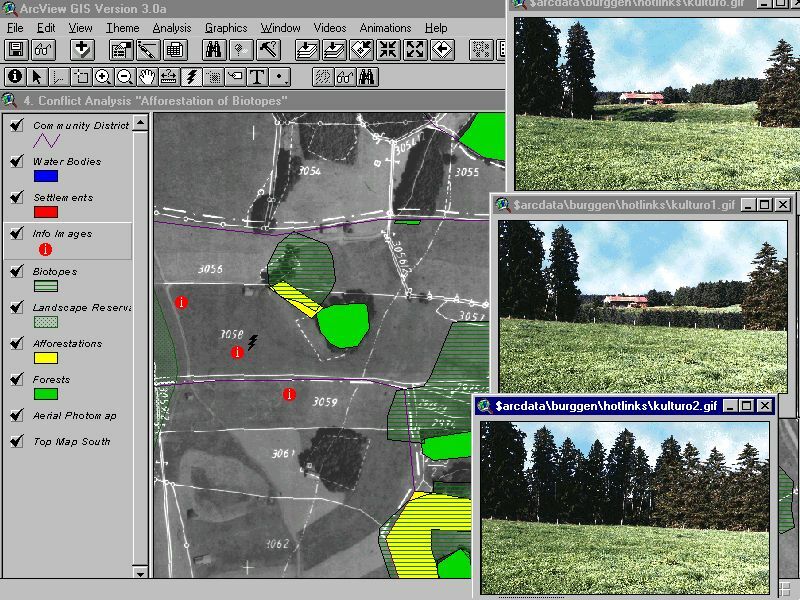 The multimedia computer presentation facilitates the illustration of often very complex planning goals and creates a sensitivity for landscape related conflicts. Only if the citizens are aware of those problems, they are willed to support the planning, which is essential for the sustainable realisation of planned proposals and measures in the field. We have chosen the GIS software ArcView 3.0 to present and visualise the data of the Landscape Master Plan (see gisdemo.jpg and burg_apr9). ArcView runs with Windows95 and comprises all multimedia capabilities of Windows95. The hardware components are a Pentium 133 MHz with 40 MB RAM (SiNix Notebook Mobile 700), sound card and two external speakers. To project the data we put the removable LCD display of the Laptop on a regular Overhead Projector or if available we used a Digital Light Projector. The data listed below were added to the vector data in ArcView. The vector data are ArcInfo coverages, ArcView shape files and vectors in Drawing Exchange Format (DXF). You start the Video interactively by mouse-clicking on the mapped standpoint, from where the video has been taken or from a programmed pull-down menu. In case of a sound video you hear all sounds at the standpoint. The mouse-click runs an ArcView Avenue script, which starts Windows multimedia player (Mplayer.exe) with the relevant *.avi file (see burg_apr3 ). Background information are b/w topographic maps and orthophotos, scanned with 200 dots per inch (dpi) in TIF format and added as a separate ArcView Theme to the active View. Scanned (150 dpi) colour photos from the study area were added to selected themes as so called „hotlinks" (programmed link to a file). You can display them on the screen by mouse-clicking on the respective theme, which starts another Avenue script. The photos chiefly help to show certain landscape aspects in a photorealistic way. They were partly manipulated with Photoshop 3.0 to illustrate the interference by man and the impact on the scenery, e.g. the extension of urban areas or the growth of spruce plantations (see burg_apr4). To give a three dimensional landscape impression a so called shaded grid has been calculated with ArcInfo based on acquired elevation data from the survey branch. The shaded grid is added as a separate ArcView Theme. If the extension „Spatial Analyst" is installed, the shaded grid can be calculated with ArcView directly (see burg_apr2). All spatial alphanumeric data can be added as dBase tables to the feature (polygons, points, lines) attribute tables in ArcView. In this way ArcView enables the user to query all features which has been added to the polygons, points and lines by mouse-clicking on it. For instance it could be helpful to add external ecological (biotope mapping) or sociological (census) data to the mapped sites. ArcInfo tins (Triangulated Irregular Network), which graphically describes space conditions in 3 dimensions, can be transformed into a 3D landscape model in VRML (Virtual Reality Modelling Language) by means of the ArcInfo command TIN2VRML. 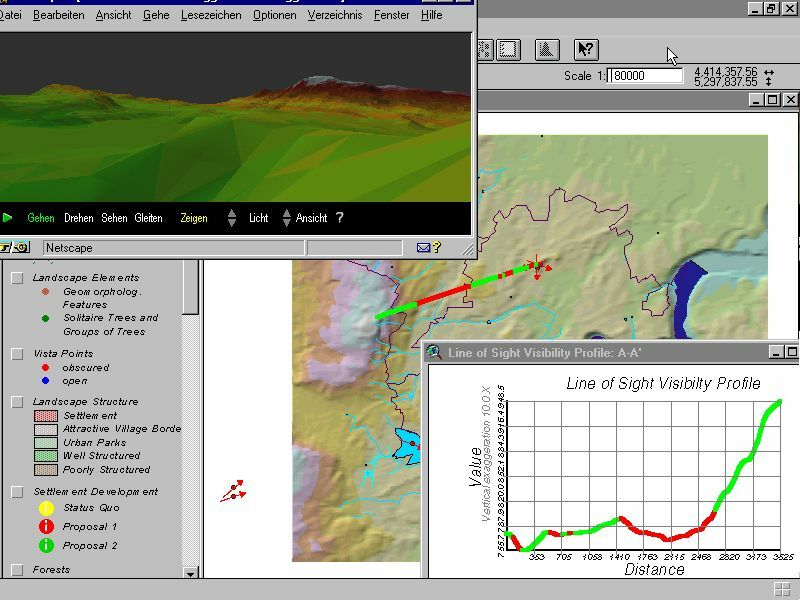 The VRML landscape model can be displayed and navigated with Netscape Gold, which even allows a realistic flight through the landscape. The model is run by an Avenue script, which starts Netscape after selecting it in a pull-down menu of ArcView. Netscape Gold 3.0 user may download and run the original VRML Landscape Model (1.4 MB !). Data storage is an essential point in data management, it is vital for the further maintenance and exchange. Commonly used media and data formats are a good choice to grant for an easy data handling on a longer term. The ISO standardised CD ROM and system independent data formats like most of the files on the Internet fulfil a certain standard and have a longer „life expectancy" than others. Data burned on a CD ROM are write protected and can be read from most of the PCs, Apple Macs and Workstations to start a digital presentation or to copy and maintain the planning data. An important advantage of digital master plans is the possibility to send the data via networks like the Internet, Intranet or Extranet. The publication of the master plan on the Internet instead informs all interested people around the clock. The reception of information is no more limited to office-hours, gatherings and official meetings late in the evening as usual. Hence the publication of planning results on the Internet in addition to the legal time limits make sense. Even filing an objection by e-mail is possible but needs to be discussed from a legal point of view. Answers to the question of the technical feasibility can be found on the Internet itself. The file formats on the World Wide Web have reached a certain standard, which is even compatible to different platforms and operating systems. Most of the Internet Browser are able to read JPEG and GIF images and to reply sound (*.wav) or video (*.mpg, *.avi, *.ram) files. Implemented small programmes of the latest Browser generations (Plug-Ins or X-Active) help to navigate three dimensional landscape models in real time, to play sound and music files, to make a phone call via Internet or to send e-mails. Meanwhile the necessary assisting programmes and Java scripts to display and query digital maps on the WWW can be downloaded from the net. For instance user shells from Autodesk (www.mapguide.com) and Esri (www.esri.com/base/products/internetmaps/internetmaps.html) to receive and read vector and GIF data. The zoom command of the shells enables the receiver to ask for more detailed data from the server, which delivers the information dependent on the chosen scale. Additionally polygons and points of the online map can be linked with reports or tables.